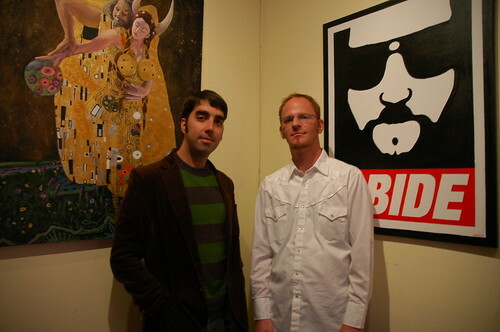 Holding court over the Lebowski Fest art exhibit are Scott Shuffitt and Will Russell, and it’s in the gallery that I have my first conversation with the founders of this oddball, weekend-long fiesta. Russell explains that Lebowski Fest started inauspiciously enough — he and Scott, both in their early thirties, met through mutual friends about seven years ago and, upon discovering their shared love for The Big Lebowski and other Coen Brothers films, began mulling the idea of hosting a party at a bowling alley with a Lebowski theme. “We figured 20 of our closest friends would show up,” said Russell, with a thick Kentucky drawl that he and Kinney also share. But they underestimated the draw their impromptu homage to the film would have. That first year, hundreds flocked to the party, many dressed as their favorite characters and quoting lines from the film as often as they made drink orders for beers, sarsaparillas, and syrupy White Russians in chintzy plastic cups. The next year, when Shuffitt and Russell decided to give Lebowski Fest another go, people came to Louisville in the thousands. Now, Shuffitt estimates that visitors from about 35 states travel to the fest, though he said as the event grows it’s getting harder to track who is coming from where. Lebowski followers are increasingly creative with their wardrobe choices, too — while many still come dressed as Walter, in his trademark field vest, or The Dude, in his bathrobe and sunglasses, or Jeffrey Lebowski, in his three-piece suit and wheelchair. But some, Russell said, spend months crafting their original costumes, not unlike Star Wars fans, Rocky Horror disciples, or Trekkies. “Last year, some one came dressed as a Creedence tape,” he said, to which Shuffitt added that several people have attended dressed like a severed toe. Outside in the rear of the art gallery, a literal backyard party is going on. 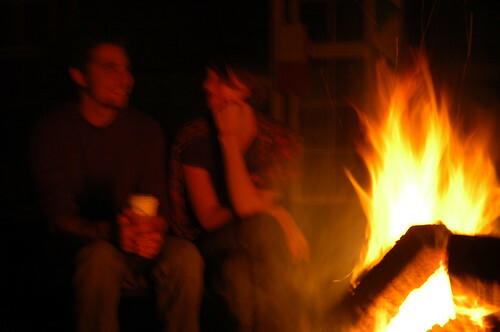 There’s a small fire to keep a steady stream of visitors warm, and a large screen portrays scenes from the film set to music. To the right of the screen, a makeshift stage has been erected in a tree, so one of the evening’s hosts, an artist who goes only by the name Kentucky Jelly, gross, has to clamor up to announce the free beer, Caucasians, and munchies that are available. Later in the evening, an independent film is screened – Tales of the Rat Fink, narrated by John Goodman and featuring the music of The Sadies, who will perform at Lebowskifest on Saturday. Rat Fink tells the tale of Ed Roth, famed hot-rod racer, designer, and, according to the film, the father of a number of pop culture phenomena such as T-shirts with original designs, pin striping, and multi-colored Macs. Shuffitt explained that the film was chosen to be part of Lebowskifest due to Goodman’s and The Sadies’ involvement Goodman is a star of The Big Lebowski and The Sadies are headlining on Saturday at L-fest. But also, because there is some cultural crossover in its content — Lebowski fans are also often connoisseurs of the American pop culture experience. Indeed, as the films credits begin to roll, the once boisterous tone of the backyard party begins to quiet, and all eyes are on the screen as complimentary bags of homemade, buttered popcorn are passed around.